This is a nostalgia purchase for me. I used to have some of the Dragon Warrior paperback books in the 80's but lent them out. The art is different, but there's still something very classy about Dragon warriors. After downloading it, I realised that it would take forever to print so I took it to a photocopy place who (after an argument about US letter format) printed (double sided) and spiral bound the 258 pages for an extortionate which compels me to tell people to pay the full price for the hard back of this - if there is one. Dragon Warriors may be a bit simplistic for some folks, but it's got a solid feel to it. Also a quick skim through reveals another curiosity - I could be wrong about this - but you only play humans. The illustrations, weapons, classes and general descriptions all point to a world (the "Land of Legend") set in the dark ages to early middle ages, where teutonic knights and gothic barbarians co-exist. I like these sorts of settings, but then I favour the slam of the broadsword when compared to the baroque hand-gunnes and ornate weapons of some RPGs. Comprehensive spell lists, a selection of monsters and a scenario are included. There's quite a bit of emphasis on back story for characters. I don't ever remember playing Dragon Warriors but still looks like one of the easier to play games on the market. Also this book is the complete article - i.e. one "core" rulebook - there are expansions but from I can tell they are not essential. Dragon Warriors may be a bit simplistic for some folks, but it's got a solid feel to it. yea from what I've seen it's a fairly strait forward system, it's design seems to be heavily influenced by D&D as 3D6 is used to generate the core characteristics and the Health Points are generated in a very similar way to Hit Points, but unlike D&D the tests are made by rolling under the characteristics on D20s (interestingly this mechanic is mentioned the first Gamers film – could they be playing Dragon Warriors? Who knows) the magic system is also heavily D&D influenced but a lot more simple in execution. It wouldn't surprise me if Morris and Johnson had sat down one day and 'Ok, lets do D&D our way, make it faster to play and easier to learn with less looking up required' and from that came Dragon Warriors, what I'm sure after they'd finished would have been to them “The Ultimate Role-Playing Game” playing in exactly the way they wanted it to. This seems to be how a lot of RPG systems at the time started – lets face it, early D&D was a mess of different rules put down into books by various conflicting authors – when the 'three barely understandable rules booklets in a box' had be out for a while, gamers started saying to each other 'that rule would work much better this way' and 'we can do better than this' and it's out of this that games like Tunnels and Trolls, Dragon Warriors and others were born, each group of gamers separately coming up with as little as a few house rules that made the system easier for them to as much as coming up with their own 'Ultimate Role-Playing Game'. This was long before the internet enabled us to discuss and swap our house-rules like we do here on tLatD, so having your games in a state ready to be published and read and played by others was a big thing. Also a quick skim through reveals another curiosity - I could be wrong about this - but you only play humans. Also this book is the complete article - i.e. one "core" rulebook - there are expansions but from I can tell they are not essential. I don't know if this has changed in the new version, but in the paperbacks the first book gives you the option of playing as a Knight, Barbarian, Dwarf, or Elf. The second book give you the rules for spellcasters. Book 3 contains 3 adventures to run and later books seem to have contained the rules for other classes (mostly spellcaster variants). One nice thing about the paperbacks is that each book contained at least 1 new adventure to run that used the new rules. The art is different, but there's still something very classy about Dragon warriors. yes the world apparently called 'Legend' (nothing to do with Tim Curry film of the same name) is the same on used in the Blood Sword series of books. Dave Morris also wrote the Fighting Fantasy book The Keep of the Lich Lord (which features a character called Lich Lord Mortis) and the Knightmare adventure books, based on one of my favourite childhood TV shows (more about the Knightmare books later in another post). However 'Keep of the Lich Lord' is set in the Fighting Fantasy world of Titan and the Knightmare books are set in the same fantasy version of 13th century Europe as the TV show). It should be noted however that a lot of the place names and creatures in Legend and Titan (and other FF worlds such as Orb) reflect each other, probably due to the great cross-over of authors and game designers on the various books and games – at the crux of it all being Ian Livingstone and Steve Jackson of course. The Legend background itself is set in a fantasy version of the time of the Crusades and unlike many other fantasy settings carries heavy Christian and Islamic overtones along side the more staple fantasy and mythological elements you find in RPG settings. It also includes real-world historical figures and place names (in this respect it draws a lot of parallels with Knightmare). As well as Blood Sword and Dragon Warriors, Dave Morris and Oliver Johnson also worked together on the Golden Dragon series and I suspect you'll see the influences of the Legend background there as well. I like these sorts of settings, but then I favour the slam of the broadsword when compared to the baroque hand-gunnes and ornate weapons of some RPGs. ... hmm I've gone off topic now... back to Dragon Warriors quick! I don't ever remember playing Dragon Warriors but still looks like one of the easier to play games on the market. like wise I haven't played due to my lack of the vital first book, but from what I've seen I'd recommend people looking for a nice easy to run system with a retro feel give it a bash. I had the first two books, and I think you might be right about playing other races. I remember not liking the ways elves were drawn, but there were may have been NPCs. I've definitely seen the second book on Ebay. Incidentally, there's references to that cover in the cover of the new edition (no clues!_. For a while I thought that the world was Orb - I glanced at Talisman of Death recently... But Legend seems to be a different setting. I'll post the map at some point. I swear part of it was the same as a map in that Heroquest solo gamebook, but I digress. Dragon Warriors (ISBN 0-552-52287-2) was the original book. It included rules for combat, a listing of weapons and armor, and a selection of opponents. 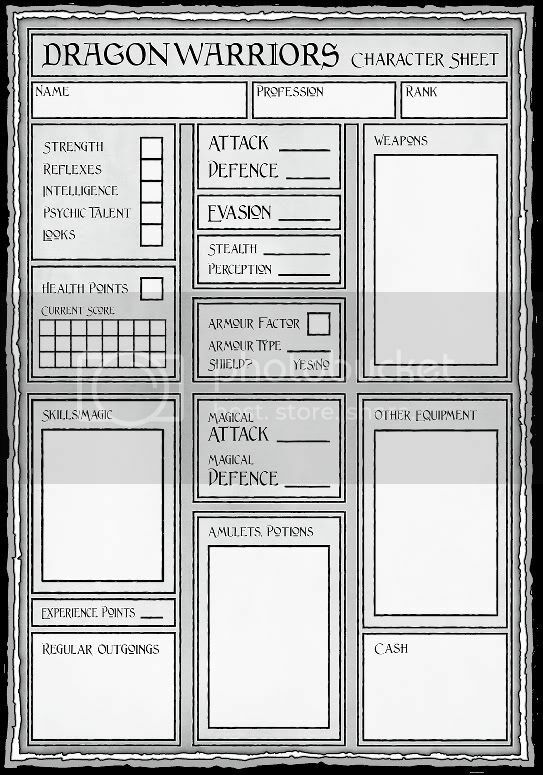 The game offered a choice of warrior classes, Knight and Barbarian, as well as the necessary information required to play a Human, a Dwarf, or an Elf. The book was published in 1985 and has 208 pages. dug my old paperbacks out because of this article, must see if I can convince some of my mates to play it again! I've got all 6 of the original Corgi books, I won the first book in a White Dwarf competition years ago! Wow, Richie - you're part of gaming history. All 6? That's dedication. Let us know if you get to play any games. Quick (but rather late) update: I do now own the newer Dragon Warriors Hardback, my girlfriend's mother found it in a 2nd hand shop and gave it to me last X-mas. Excellent. I'm a bit jealous, because mines just a laser printed version in two bindings. Lucky find! Mortis if you are still looking for DW book 1 have a look on Amazon, there are some for sale on there!